Only a handful of enticing day trips present themselves to holiday makers visiting Anchorage, with some beautiful natural scenery and outdoor attractions being situated directly to the south, around the Kenai Peninsula. The Seward Highway heads in a southerly directly from Anchorage and is literally carved into the side of a mountain, with many breathtaking lookouts and scenic attractions along the route. Those driving on the Seward Highway will soon reach Portage, where a toll road leads to Whittier - for its ferry to Valdez. From Anchorage, northerly attractions are best reached via the Glenn Highway, unless you fancy chartering a small plane and marveling at the subsequent aerial views. The Kenai Peninsula stands on the southerly coastline of Alaska and extends to the southwest of the Chugach Mountains and directly to the south of Anchorage. Separated from the mainland by the Prince William Sound (east) and the Cook Inlet (west), the Kenai Peninsula is edged by the Kenai Mountains and the Kenai Fjords National Park. 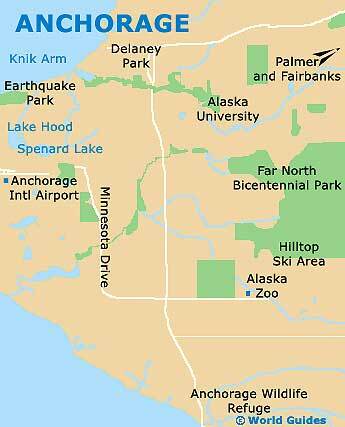 Amongst the main attractions on the peninsula are the innumerable hiking trails and kayaking opportunities, together with the town of Seward and its Alaska SeaLife Center, and also the Sterling Highway, where both the historical mining town of Hope and the popular tourist destination of Homer are to be found. The small town of Homer is an especially friendly and charming spot on the Kenai Peninsula, and lies approximately 223 miles / 359 km to the southwest of Anchorage, where it has become a popular weekend getaway. Homer's main attractions tend to relate to its stunning setting, with the town being located alongside the beautiful Kachemak Bay and surrounded by a series of majestic mountains. There is a definite Bohemian atmosphere within Homer, with many 'New Age' artists and hippies now residing here. Top attractions include the Kachemak Bay State Park, the Skyline Drive and the Homer Spit - a 4.5-mile / 7-km narrow peninsula jutting out into the bay. Native Alaskan artifacts and marine displays are situated within the Pratt Museum, while the best hiking trails and beaches are situated along the Shoreline Route. A northerly inlet of the Gulf of Alaska, the Prince William Sound is flanked by a towering mountain range and is brimming with native flora and fauna, with wildlife attractions including sea lions and harbor seals, sea otters, grizzly bears and even killer whales (Orcas). The Prince William Sound is part of the Chugach National Forest and is home to a collection of small islands, such as Cordova, Hawkins Island, Hinchinbrook Island, Montague Island, Whittier and Evans Island, the latter of which is where the busy Alaskan fishing port of Valdez is sited.